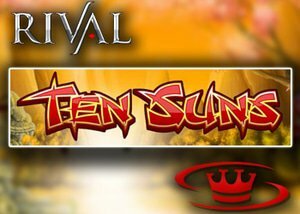 Rival Gaming has just announced the release of its newest slot, Ten Suns, a 25 line, 5 reel video slot based on the infamous ancient legend. This slot will place you in the heartland of China and its historic past. The basic of Ten Suns takes you back to a time when the Moon Goddess and Emperor watched as archers fired arrows at nine of ten suns to release Phoenix birds. Filled with many iconic ancient Chinese symbols, Ten Suns includes a treasure chest, golden toad, phoenix, dragon, a trio of coins, lanterns, lotus flower, the emperor and a princess. The balance of symbols found are a number of Chinese letters. The Archer acts as the wild symbol. Whenever a win is awarded, the archer can expand to the left, right, up or down. This powerful symbol only is seen on reels 2, 3 and 4, and can appear on multiple reels at once to allow for substantial winning potential. Three or more treasure chests will see a pick and click feature become active. Select your treasure chests and be awarded a coin win. This is a base game only feature. Another Rival Gaming added feature is the bonus game, is the responsibility of the Dragon, as when three dragons are seen on the reels it will activate free spins. During those spins, all low paying symbols are removed from the reels and the remaining symbols become drop symbols. Any time a win takes place, those symbols disappear and are replaced by new icons to allow for additional possible wins. One of our recommended Rival Gaming casinos is Vanguards Casino, currently, new players can receive an exclusive $20 Rival no deposit bonus when they register today. After enjoying the no deposit bonus, a 100% match bonus up to $500 is waiting for new depositors. Vanguard offers an abundance of action-themed slots, table games, video poker, blackjack and other table games. Some of their most popular games include Atomic Age, Blazing Buffalo, Diamonds Downunder, Gnome Sweet Home, Fast Lane, Metal Detector, Reel Party, Scary Rich 2, So 80's and Swinging Sweethearts. Register today, claim your $20 no deposit bonus and enjoy world class gaming.